Baptism is requisite to the cleaning of sin before a person may enter the kingdom of God. It is an essential part of the gospel. No unclean thing can enter the kingdom of God and partake of the Holy Spirit. The Holy Spirit will not dwell in unholy temples (bodies). Baptism, to be effective, must include a total penitence and turning away from sin. Baptism, to be recorded in heaven, must be administered by a proper officer of the kingdom of God, who is called by the spirit of revelation, and ordained under the hands of one holding such priesthood. Without baptism of water and the Spirit, no person can enter the kingdom of God. Confirmation into the kingdom of God brings many very special gifts; including gifts of the Holy Ghost. This was God’s law from the time of Adam, was administered the same under Jesus and the Apostles, and is administered exactly the same way today. Neither God, nor His spiritual law ever changes. This tract was originally published by Wingfield Watson in 1899. I converted it to digital format and modern typesetting. Some new headings have been added. 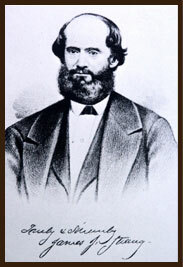 Samuel E. West, Elder. WHAT IS IT DESIGNED FOR? IS IT A SAVING ORDINANCE? IS IT A COMMANDMENT OF GOD? I propose in this little essay on baptism to show: First, that baptism, as a gospel ordinance, is design­ed “for the remission of sins.” Sec­ond, that it is administered only by IMMERSION. Third, that it is a SAVING ordinance. Fourth, that it is a COMMANDMENT of God, alike binding upon all. Baptism for the remission of sins was reckoned a burial of the former sinful life, and the being raised out of that baptism was reckoned a resurrection or raising to a new life: that is the new life enjoined by the gospel. So it is written: Know ye not, that as many of us as were baptized into Jesus Christ were baptized (or buried) into his death? “Therefore we are buried with him by baptism, into death;” that is, the death of our former sinful life. That like as Christ was raised from the dead by the glory of the Father, even so we also should walk in newness of life. For if we have been planted, “buried,” or “baptized” together in the likeness of his death, we shall be also in the likeness of his resurrection, knowing this that our old man (our former sinful life) is crucified (slain) with him, that the body of sin might be destroyed, that henceforth we should not serve sin; for he that is dead is freed from sin. To the ordinary reader it is a little difficult to understand these sayings of Paul; nevertheless repentance, or turning from our former sinful life, is [Page 2] deemed by Paul a crucifixion of the old man, and being baptized for the remission of all past sins, is a burial to the former evil life, and the being drawn forth out of the water of bap­tism a resurrection to the new gospel life. And all these things are a very interesting likeness of the crucifixion, death, burial and resurrection of Jesus Christ. Having established this fact, I will now see if immersion only is baptism. And to begin with, let me say that there is not a single passage in all the New Testament to give color to, or prove that either sprinkling or pouring was used in apostolic times for baptism. And there is no case of baptism mentioned in that book but what all lend to the conclusion that immersion only was practiced in those times. First of all the word baptism itself in its present and ancient meaning never did mean anything else than dip or immersion. And this is so well known by all men learned in Greek, that it is surprising any one should question it. But let the scriptures themselves speak. Now the question arises, if pouring or sprinkling was used here, what is there in the above account that even hints at such a thing? What would be the use of going down all the way to the River Jordan, and getting right into it, in order to be sprinkled, or poured? “And straightway coming up out of the water he saw the heavens opened, and the spirit like a dove descending upon him,” etc. Now the words “buried” and ”planted” in those two texts imply the being immersed or covered with the water of baptism; for we can neither be “buried” nor “planted” without being “covered.” And as Jesus says: “Verily, verily, I say onto you, except a man be born of the water, and of the spirit, he can­not enter into the kingdom of God .” The same allusion to immersion implied here, for as to have a natural birth, is to come forth from being hidden, covered or concealed, so to be born of water is evidently to come forth from being hidden, buried, or concealed in it. Here we will leave this matter with the intelligent read­er to decide for himself as to whether baptism was anciently performed in any other way than by immersion. [Page 3] But I will here add the testimony of a few distinguished Greek scholars. John Wesley says: “Buried with him in baptism,” (Rom. 6:4), alludes to the ancient manner of baptizing by immersion. A good many other distinguished authors inform us that baptism was changed from immersion to sprinkling by the Catholic Church. And this is undoubtedly true. For the Catholic Church themselves do not deny, but confess this fact. Now if Jesus is to be with his peo­ple up to the end of the world on the condition that they keep all things whatsoever he commands them, then we conclude that all these things together are saving, baptism with all the rest, simply because it is a commandment, as all these are commandments of God. If that ordinance instituted by the Savior of Mankind, for the remission of sins that are past, is not es­sential to salvation, or is not a saving ordinance, we do not know what ordinance or principle is saving. The only reason it is not saving too many is because for some unaccountable reason, or cause, men do not confide in or regard it as they ought. They might as well say there is no merit in the Sacrament of the Lord’s Supper, or in observing the Sabbath day, or in visiting the sick, the poor and needy. Has the putting away of sin by the ordinance of baptism, nothing to do with men’s salvation? Very well, then, did those who rejected this counsel of God against themselves, obtain salvation to their souls? I tell you no, most decidedly. They did not, and none ever can, who will reject that counsel. For all things written of it shows it to be the work of God and clearly necessary to salvation, and must therefore have been commanded of God. But I will proceed however to show that God has most earnestly commanded it. Now why this uniformity of requiring all to be baptized, both by John and Jesus and Peter and Phillip among the Samaritans and commanding all to come to it, if it were not a command of God? Has God respect of persons? And if he excuses any one from conforming to this command, where is the excuse found? You point perhaps to the thief on the cross, and say “surely here was an exception, for this thief had no time to be baptized.” And thus you try to make the decree of Jesus, a mere halter of sand, instead of being as it really is, a decree so [Page 5] universal that none can escape it, except little children—who know not good or evil, and are therefore under no moral responsibility. And then again, “Lord remember me when thou comest into thy kingdom.” What did he know or what could he know of the character of Jesus any more than any other unbeliever, who rejected the counsel of God against himself? What could he know of either the innocence of Jesus’ character, or of his kingdom, or whether Jesus was ever going to obtain a kingdom such as Jesus laid claim to, if he had not received the gospel of the Kingdom as it was preached in his day, and rendered obedience to it? For John said in order, “That he should be made known, or manifest to Israel, therefore and I come baptizing with water. But those who disregarded John’s teachings had no such manifestation. They only could see that Jesus was an impostor and traitor to his country. But supposing that this be regarded as unsound, does it follow that this thief went into heaven the same day that Jesus expired on the cross? Not at all, for Jesus on the day of his resurrection said: “Touch me not, for I am not yet ascended to my Father.” (John 20:16, 17) So when Jesus said to the thief, “this day shalt thou be with me in paradise,” it must not be regarded as a promise that he was on that day going to be with Jesus in the kingdom of heaven for all who have spoken of the time between the death and resurrection of Christ, tell us that Jesus was during this time ministering to the spirits of the departed dead. Paul, speaking of this time, says: “Now that he ascended,” or went up to God, “what is it but that he also descended first into the lower parts of the earth.” Now the “lower parts” of the earth are not on the surface of the earth, where the sepulcher was. This would require no descent. So whether or not the thief on the cross was or was not a baptized man, there is no evidence that he went into heaven on the day of the crucifixion, or that he will be excused from obeying the ordinance of baptism if he had not already obeyed it. Now I will say further here that the plan of salvation, its ordinances, promises and requirements, [Page 6] are all the same today, and all its promises are just as fixed and sum as they ever were at any time during the ministry of Christ and his apostles. The same faith is required today as then; the same repentance, or turning away from all evil, and the same commandments are required to be kept. The same ordinance of baptism by water for the remission of all past sins, and the same ordinance of laying on of hands by the elders of the church for the gift of the Holy Spirit of God have not changed one iota. Anyone who will dwell a moment on the following passages must see the force of the above sayings; or in other words, that the gospel of Jesus Christ has never changed a particle from the time of Christ and his apostles until this day, and must remain the same as long as a man remains on earth to be saved. Well, having added these very strong and earnest testimonies against either altering, changing, abolishing or disregarding any one part, or principle, or promise of the gospel of Jesus Christ, it will be well to introduce a few more points to show that the Gospel was not a new order of things introduced in the days of John and Jesus, but an order of things at least as old as Adam, and that men in no age of the world could be saved without obedience to its requirements. “Moreover, brethren, I would not that ye should be ignorant, how that all our fathers were under the cloud and all passed through the sea; and were all baptized unto Moses in the cloud and in the sea, and did all eat the same spiritual meat, and did all drink the same spiritual drink; for they drank of that spiritual rock that followed them and that rock was Christ.” (1 Cor.10:1-4) “Spiritual meat and spiritual drink” is undoubtedly the gospel of Jesus Christ. Now, to those who obey the gospel of Jesus Christ, and truly turn from their sins, God has promised the precious gifts of the gospel as they are mentioned in the 12th, 13th and 14th chapters of Paul’s 1st Epistle to the Corinthians; Mark 16:15-20; Acts 2:38-39; Acts 10:44-46; and Acts 5:32. I entreat the reader to examine these promises, and ask himself if God could be just, and without respect of persons, not to give these gifts to those who serve him in these days, as well as to those who served him in days gone by. “Now concerning spiritual gifts, brethren, I would not have you ig­norant,” says Paul, (1 Cor. 12:1), but these are just what modern divines would have the people ignorant of; they would have them ignorant of the grand fact that the gifts of God’s holy Spirit are as freely and universally promised today to the truly honest believer in Jesus Christ, as that salvation is freely and universally offered. If God takes away the gifts which his son Jesus Christ has so freely offered to his servants, there is just as good reasons for believing that salvation is withdrawn also. “The manifestation of the Spirit is given to every man to profit with all.” (1 Cor. 12:7-11) “For to one is given by the Spirit the word of wisdom; to another the word of knowledge by the same Spirit; to an­other faith by the same Spirit; to another the gifts of healing by the same Spirit; to another the working of miracles; to another different kinds of tongues; to another the interpretation of tongues; but all these worketh that one and the self-same Spirit, dividing to every man severally as he will.” For as the [human] body with its “many members, is but one body, so also is [the body or church of] Christ.” “For the [hu­man] body is not one member, but many.” If the whole body were an eye, where were the hearing? Exact­ly. And upon the same principle, if only one gift exists in the church of God—that of preaching for instance—how much better off is she than the human body that has been deprived of all its members except an eye, or an ear, or had only one foot left? As such a human body would be, so is the church deprived of, all these spiritual gifts. But the church of God, endowed with these spiritual gifts, is esteemed by Paul as a perfect human body endowed with every member. And as the eye of the human body cannot say to the ear, “I have no need of thee, or the hand to the feet, I have no need of thee.” So no part or member of Christ’s church endowed with any one of the spiritual gifts, can say to any other, member, endowed with any other spirit­ual gift, I have no need of thee. And indeed what could be more reason­able? For if the gifts of healing have once been known to exist in the church, for instance, who in that church was authorized to say, “we have no need of thee?” And again, if the power to cleanse the lepers, cast out devils, cause the lame and cripple to walk, was once known to exist in the church of God, who was authorized to say, “we have no need of thee?” And if the gift of prophecy, which “edifies the church,” and the gift of tongues that was “a sign to unbelievers,” and if the gift of discernment of spirits that was necessary to prevent men from being deceived by foul spirits were all known to exist in the church of God, for the purposes intended, who was author­ized at any time to say “we have no need of thee?” How could this thing be said at any time in the history of the church, without maiming and doing violence to, and dismembering the church of God? It could not at anytime in the church’s history be done away without dismembering the church and leaving it like a human being deprived of all its most useful members and leaving it only a mere motionless trunk, unable to walk, unable to hear, see, feel, smell or taste. Thus, this very interesting comparison or likening of the church of God to the human form, shows in the clearest manner possible that the gifts of the gospel could not be rejected, resisted, or done away, without doing the grossest violence to the church of God, in fact depriving it of life. So according to this, it is no wonder that the old Christian church is found today divided and shorn of its once beautiful and glorious gifts, [Page 9] proportions and strength, and that men are groping in the dark like the blind man for the walk, and nothing but confusion, doubt, darkness and uncertainty reigns every where in the so-called modern Christian churches. I answer that the saving blood of Christ has no saving effect upon any one except on the condition of obedience to the gospel of Jesus Christ. And whatever any of the Apostles have said in regard to the blood of Christ, being a sacrifice for the sins of men, it is promised only to those who had obeyed the gospel of Jesus Christ, and had entered into his church through its ordinances. The blood of Christ affects no others except little children. According to these sayings, it is a vain thing for any man to claim that he loves God, who disregards his commandments; for the keeping of his commandments is what proves that he loves him. We see then that there is absolutely no substitute for the gospel of Jesus Christ. And all [Page 10] the modern sectarian follies, “Come to the foot of the cross and wash away your sins in the blood of Jesus,” “Come and wash in the blood of Jesus,” “Come and apply the atoning blood of Jesus,” “Come and cast all your sins upon Jesus,” “Come and get salvation,” etc., etc., utterly disregarding the rules that Jesus himself has laid down for the remission of sins, are all but the hollowest mockery of the true gospel of Jesus Christ. And all such words are vain in the sight of God. And now kind reader please read the next few page on authority to administer in the ordinances of the gospel, as a minister of God. Having as I trust by the help of God proved baptism so plainly to be an ordinance for the remission of sins, a saving ordinance, and a direct commandment to all men, few I think will be disposed to question it. But as baptism is one of those ordinances or sacraments of the gospel of Jesus Christ, which must be administered in the name or by the authority of the Father and of the Son, and of the Holy Spirit, I propose now to show what it is to act in the name, not only of God, but in the names of men and kings and nations also. The object and importance of this law is apparent to all. To set it aside would be to involve the state in ruin, reduce it to a mere mob and place the lives and property of the people at the mercy of the lawless. There would be no safety or protection to life or property; and like as in California, Oregon, Kansas and Nebraska, and all other new territories more or less, before law and a body of officers were chosen and qualified, to expound, enforce and execute the law, every man in meeting his fellow would try to be first with his finger upon the trigger, as his chief protection. A very similar law to that above quoted, is found in every civilized state and nation on earth. This law merely forbids men to act in the name of the people of the different states—emperors, kings and monarchs, where they exist, when not legally authorized and qualified so to do, according to the law under which all persons are empowered to act in these different names, and punishes them for its violation. All organized bodies of men, from the school district to the most powerful monarchy, must have officers to transact the business growing naturally out of the wants of the people composing them; and to create those officers there are and must be well defined laws, showing and making [Page 11] plain how those men must be appointed to act in those different offices, and, when thus clothed with power, to enter upon the duties of those offices, they act “in the name” of the body or state or individual which has thus chosen them. The officers of the school district act in the name of the school district. All state officers act in the name of the people of their respective states. The officers of the United States act “in the name” of the people of the United States. The officers of monarchies or empires act in the name of the sovereign or emperor from whom they derive their authority. This is a rule to which there is no exception. And it is also a universal fact that where the authority to legislate or to make laws exists, there also exists the power to authorize men to expound, administer and execute those laws for the common protection and defense of all the people. It thus appears, and very plainly too, that to act in the name of any person or people is TO ACT IN THEIR AUTHORITY, when it is legally and properly conferred; and to so act without being; legally and properly called and chosen by the person or persons in whose name one acts, is to become a transgressor, an impostor, a usurper and a criminal. This great principle, so universally necessary to the well-being of all people, was first derived from the laws and government of God. For God first ruled the nations, both before and after the flood, and it was in departing from that government that brought untold calamities and destructions upon the nations; for God is the sole author of all good and true government, and whatever is good as a principle in government, ancient or modern, has all been derived from him. But as for those who run without being called and sent according to that which is written, their works will all be vain. Not only will they be vain but God has said that he “will not hold them guiltless,” because they assume to act in the name of God, and his son Jesus Christ, without being either called or sent by him. “Now I beseech you brethren, in the name (authority) of our Lord Jesus Christ, that you all speak the same thing, and that there be NO DIVISIONS among you, but that ye be perfectly joined together in the same mind and in the same judgment.” (1 Cor. 1:10) And the Lord Jesus prayed earnestly for the church in his ministry that they all might be one, “as we (the Father and Son) are one.” Neither pray I for these (my disciples) alone, but for them also which shall believe on me through their word, that they may be one, as thou, Father, art in me as I in thee, that they also may be one in us, that the world may believe that thou hast sent me. And the glory which thou gravest me I have given them that they may be one, even AS WE ARE ONE.” (John 17:20-22) Now there is perfect harmony and agreement and unity between the Father and the Son. No clashing of creeds and opinions and doctrines there. And this is precisely the kind of harmony and unity that the Father and Son require in his church. And where that unity and [Page 13] harmony in the faith and doctrine of Christ is not, there the church of God is not. “For whereas there is among you envying, and STRIFE, and DIVISIONS, are ye not carnal and walk as men?” (1 Cor. 3:3) That is, are ye not acting upon the dictates of your own corrupt minds, and as unconverted men? God is not the author of these things, therefore the modern churches, where all these carnal doings are found, are not yet converted to God, but are walking after their own corrupt ways. And as God hates all these things, he has never called nor authorized any man or set of men to found and build up these divisions as his ministers. That is plainly evident. Now, to be brief, the scriptures speak of two orders of priesthood­—the one called the Aaronic Priesthood, and the other the Melchisedec Priesthood; and these two priesthoods mean the two orders of officers which God placed in his kingdom to be the leaders, rulers and instructors of his people. These priesthoods were divided into a variety of offices, or classes of officers, each class having duties and responsibilities assigned him to perform according to the needs and circumstances of the people. The offices of these two priesthoods are ever the same, though in different ages they have been called by different names. The word apostle, for instance, was formerly messenger, or ambassador. All three of these terms mean the same thing, only apostle is the Greek for messenger or ambassador. “Performeth the counsel of his mes­sengers,” that is that brings to pass all the words of his prophets or messengers or ambassadors. “Who is blind, but my servant, and deaf as my MESSENGER that I sent.” (Is. 42:19) Here is another translation of the same words in this last text: “Hear ye deaf and look ye blind that ye may see. For I will send my MESSENGER (apostle and ambassador) unto you that are blind, yea a messenger to open the eyes of the blind and unstop the ears of the deaf. And they shall be made perfect, not withstanding their blindness, if they will hearken to the messenger, the Lord’s servant.” The reader can choose either of these renderings. I am, however, decidedly in favor of the latter rendering, for God’s prophet or messenger is neither blind nor deaf, physically nor spiritually, but always well pro­vided with both spiritual and temporal, or physical sight and hearing. “Then spake Haggai, the Lord’s messenger, in the Lord’s message to the people, saying, I am with you, saith the Lord.” (Haggai 1:13) These texts show that apostles and messengers or ambassadors are identically the same. Some one may ask, how all this helps us to distinguish the true minister of God in these days from the false or spurious pretender? In this way: First, that God has no different order of things, or any different way of accomplishing the salvation of man today than he ever had in the past. His government is the same, his laws are the same, and the [Page 14] manner of choosing his officers and conferring his authority upon them is the same. If God should change in any of these matters, it would be impossible to prevent our being deceived and led to destruction. If God has changed in any of those matters, it would be first in order for him to have put it on record that he has so changed, and tell us wherein he has changed, so that we may follow the change. But we are forbidden to believe that he has changed in any matter pertaining to the order of his church and kingdom and man’s salvation. And now, as the order of God in all ages whenever he had a people or a church on earth, was to place in that church, “first apostles,” or in other words, first ambassadors or messengers, one of whom was chief, the latter called by his own voice, and anointed under his own hands and voice, through whom all other apostles or prophets, evangelists [high priests], bishops, elders, pastors or teachers were called, and received ordination, so it is now. All the ministers of God in every age, greater and lesser, were ordained to be his ministers, and all ordinations came from the greater to the lesser. The greater, who were called apostles of different degrees or ranks, are all appointed by direct revelation from God, and the lesser officers are called and appointed by a law that points out their duties and the sort of men they should be, but their ordinations always came from the greater placed above them. Now, why could not these men be set to work in their office of deacon in the church of God without the laying on of hands? Simply because first, it is contrary to the law and commandments of God; and, second, because all men in proportion to the responsibilities of their office and calling receive proportionate gifts and blessings to help them in their office work and ministry. These texts are offered here to prove, as before said, that the lesser officers in the church of God were called according to a fixed law pointing out their qualifications. But the greater officers were called by direct revelation, more particularly those who were called apostles or the ambassadors of God in their various grades; for there are different grades or degrees of the apostolic office. Jesus himself was called an apostle; that is, a messenger or ambassador from the Almighty himself, whereas the other apostles were called through him by revelation and were subject to him. Thus it has been in all the prophetic ages. God first calls and anoints one to stand between him and the whole people. With him he speaks “face to face as a man with his friend, and not in dark visions.” The less difficult questions were consigned to be settled by the lesser officers or judges, but the most difficult of all questions were brought to the prophets themselves, who were God’s chief ambassadors. Thus it has been from Adam to Moses, and from Moses to Elijah, and from Elijah to Christ, and from Jesus to John the Revelator, and in this generation it has been the same. All the great questions and decisions fell to the lot of Joseph Smith and his lawful successor in the prophetic office, showing clearly that the order of the everlasting priesthood and its office work is ever the same. By this order of things the church [Page 16] of God should be known from all other churches, for as the leading men of God’s church in all ages were all called by direct revelation from God, all careful bible readers should be able to find that church by this very mark, if that church was on the earth at all. (There were times when the church of God was not on the earth, and of course it could not then be found on earth by anyone.) But when it exists on the earth, it will or can be found by enquiring for that church whose chief officers are appointed by direct revelation from God, through the chief of whom God reveals his word to all his people, as in days of old. It would be a vain thing for any honest man to try to find such a church anywhere in what is called Modern Christendom, from the church of Rome herself to the least and last “reformed church” that has arisen in the last decade; for they every one deny that revelation has been necessary since the giving of the revelations of St. John on the Isle of Patmos, and deny that any revelation from God has been given since that time. We take them at their own words; for most assuredly if God revealed anything to any of them they would tell us all about it. The Bible is a book that from lid to lid teaches the necessity of revelation from God, and never speaks against it. As said above, God’s chief ministers in all ages, from Adam to John the Revelator were always called by the voice of God, and angels were sent to commune with and ordain the chief apostle. Moreover, as God has always placed at the head of his church, first, apostles or ambassadors, and as an ambassador is one specially sent, and God has nowhere any different rule for sending his min­isters or ambassadors than by direct revelation from him, and as we are told in many places that he changes not; that from age to age he is the same, (Mat. 3:6; James 1:17; Num. 23:19; Rom. 11:29; Ps. 102:25-27), we must believe either that he has changed, or that man has grossly changed and departed from him, for we find nothing today that looks like his ancient order and way of working among either Catholics or Protestants. But God forbid that we should suppose him to change. It is easy to believe that man may and does change, but God never. We must believe that the change is in man. Let us look first at the Catholic Church, by far the oldest and the mother from whom all the others sprang by departing from her. Her Popes claim to “occupy St. Peter’s chair;” that is, that they are the regular successors of St. Peter in his apostolic and prophetic office. Now, a successor to the president of the United States is a president of the United States, and whatever the power necessary to make any one president of the United States, the same power it takes to make his successor, as long as the present constitution exists. The successor of a king is a king, and whatever power, and by whatever law a king is made, the same power, exercised according to the constitution of his realm, must make his successor as long as that constitution remains unchanged. And it is just so with all other sovereigns, governors and rulers the world over, and through all time. And to obtain any one of these places or positions without receiving it under the power and according to those several constitutions is to be guilty of treason and usurpation in the first degree, and endangering the life of the state or nation where it was done. Now, we have absolutely no ground for believing that the law and constitution of God’s kingdom, by and under which apostles and prophets were made, is either altered or changed in the least. [18 For verily I say unto you, Till heaven and earth pass, one jot or one tittle shall in no wise pass from the law, till all be fulfilled.” (Matt. 5:17] And so upon the principle that whatever power makes the predecessor in office must make the successor, the same power therefore that made Peter the chief apostle or ambassador of Jesus Christ, MUST OF NECESSITY MAKE HIS SUCCESSOR TODAY. Why not? Who has any sound argument to offer against this? [Page 17] And now the question arises: Are the popes of Rome, the so-called successors of Peter, called and anointed to succeed Peter by the same power that called, anointed and ordained Peter himself? Verily, they are not. There is not the slightest resemblance between the manner of calling and inducting the popes of Rome into their office and the calling, anointing and ordaining of the apostle and Prophet Peter into his office. Not the slightest. For instance, if a pope was to be chosen today to fill the present Pope’s place, it would be done by the vote of the cardinals. Some bishop of the Catholic Church is thus selected out of several other candidates for the office, and he is really not ordained or anointed at all. He is ordained a bishop, to be sure, but when elected pope by the cardinals he receives no further ordination. “None but the cardinals and two conclavists for each (one an ecclesiastic and the other a soldier), remain in the conclave. Those cardinals who are princes, or who are old or infirm, are sometimes allowed three. The other persons appointed for the service of the conclave are the sacristan, the under-sacristan, a secretary, an under-secretary, a confessor, who is always a Jesuit, two physicians, a surgeon, two barbers, an apothecary and their apprentices, five masters of the ceremonies, a bricklayer,[Page 18] a carpenter and sixteen porters or valets for hard labor. “Though the office of a conclavist be incommodious and uneasy, yet on account of its privileges it is much sought after; for a conclavist is sometimes the secret agent of the ministers of crowned heads. Every officer, however, of the conclave takes an oath not to reveal any of its secrets. Does the reader see any likeness here between the calling and inauguration of the popes in office and the call and ordination of the apostle Peter under the hands and voice of the Anointed Jesus? If he does, I confess that he has a faculty for seeing that I never expect to attain to. We might about as well say there is no difference between a crystal fountain and a mud-puddle. We might as well say there is no difference between the light of a brilliant lamp and the thousand sparks flying from a chimney in a dark night. But I will not argue this, for it is to be presumed that no one can see any likeness between the two modes of conferring authority. But upon the principle that “whatever power and acts are necessary to create and install the predecessor in office are also necessary to create and install the successor in office as long as the constitution of the nation or church remains unchanged,” what becomes of the claims of the Catholic Church that its popes sit in the chair of St. Peter and succeed him “in the functions of his office”? Is there any change made in the constitution or the law and testimony of God’s church? And if there is any change made therein, who made it? Where is it recorded, and when was it made? And who has anciently put it on record that such a change in the law and constitution of God’s church and kingdom would be made? That, “The successor of an apostle is an apostle. The successor of a prophet is a prophet. The successor of a high priest is a high priest. The successor of a king is a king. The successor of a bishop is a bishop. The successor of an evangelist is an evangelist. The successor of a deacon is a deacon; and, in general, that the successor to him, who holds any particular priesthood or office, holds the same priesthood or office as the predecessor.” That whatever pertained to the predecessors in ANY priesthood or office, as regards power or gifts, or privileges, keys or authority, or power to unlock the mysteries of the present, the past or the future of the kingdom of God, pertains or belongs to the successors also. There is no use today for any more than one president or supreme ruler to any people or any nation, and never was. And the same rule holds good as regards the church of God. The prophets of God in all ages, when there was a church of God organized on earth, were the supreme rulers immediately under God to that church or people. Peter undoubtedly, when the Savior was taken, was the supreme presiding officer over the whole church of God. And it is but reasonable to conclude that he was made so by ordination after the resurrection, [Page 19] according to the promise and instructions given to him by the Savior before and after, for no power or priesthood is given any man to lead the church of God only by ordination. Now let us see: Peter was ordained by the highest authority that was ever bestowed upon man; that is, by the voice and under the hands of the Lord Jesus himself, and great gifts, inspiration and power was bestowed upon him in this ordination. Peter had the privilege then, like all other prophets, of conversing with the angels of God, and with God himself. He also saw the resurrected Savior, conversed with him, received blessings and promises from him and witnessed his ascension into heaven. If it be true that the powers and privileges of the predecessor belong of right also to the successors in the same office, where are these blessed privileges known to or possessed by any of his so-called successors, the popes? Peter in virtue of his ordination was a seer, had the gift of prophecy, and some of them point very forcibly to this generation, mind are especially fulfilling in these days. But where are the pope’s powers, prophecies, miracles, inspiration, ministry of angels or revelations from God? Does he possess any of these in any degree any more than the cardinals, the bishops and priests under and associated with him in his church? Where is the gift of tongues, the gift of healing, the gift of prophecy, power to do miracles, cast out devils, the ministry of angels, or the voice of God in the Catholic Church any more than in her daughters, the Protestant churches? Is it not as clear that the priesthood of the Catholic Church is as purely the work of man as it is that the priesthood of the various Protestant churches is? How then can any of these man-made institutions authorize men to act in the name of God, and the Lord Jesus and the Holy Spirit of God, when it is as clear as any one fact can be that they are all acting under a. usurped authority and priesthood? How can any of these act lawfully in the name of the holy three when there is no communication from them, and they claim none? We can easily see how the officers in the armies of the United States can act in the name of the United States, because they are chosen and commissioned by the United States, and receive constant directions from those above them whom she has lawfully commissioned to act above them. We can easily see how the officers of Great Britain in Ireland and Canada, and India and Australia, and other colonies can act in the name of Great Britain, because Great Britain calls and clothes these chief executive officers with power and authority to execute and enforce the laws made for the colonies. But supposing the colonies should arise and condemn those lord lieutenants or chief executives as impostors and deceivers, and kill or drive them out one after another, and begin to claim that they had law and jurisprudence enough, that the canon of law was full, and that there was no need of any more communications from Great Britain upon state matters, and begin to count all who claimed any intelligence from Great Britain as madmen, enthusiasts, fanatics and deceivers, and while they still pretended to act in the name of the government or the sovereign of Great Britain, begin to alter, change, amend or abolish the laws enacted by Great Britain for the welfare of the colony, we would have a farce complete, and a pretty good illustration of the position occupied by the church of Rome and all her Protestant daughters towards the God of Heaven and his heavenly messengers. I merely use the picture to illustrate the position; and not by any means because I regard Great Britain as either a model or a perfect government. “The earth also is defiled under the inhabitants thereof, because they have transgressed the laws, changed the ordinance and broken the everlasting covenant. This will refer to no other nation than old Rome, and of a certainty she is the power referred to here. Why I say, “on these conditions”—on the condition that they teach “all nations ALL THINGS WHAT­SOEVER I HAVE COMMANDED YOU”—is that it is fully sustained by the scriptures throughout. For there is absolutely no promise in scripture that God ever will be with any people who have made up their minds that they will follow their own inventions, rules and regulations, instead of his commandments. How was it when Israel set up a calf as a god and were determined to follow it into Egypt? Was God with them then? How was it with Corah, Dathan and Abiram? Was God with them? How was it with Saul, King of Israel, when he undertook to rule according to his own will instead of God’s will, set forth in his law and commandments? Refusing to repent or turn from his evil deeds, he could not win the favor of God, although Samuel, the prophet, pleaded and mourned, and fasted before God in his behalf many days. When the wicked kings of Israel led Israel to commit sin, how much was God among or with them, especially when they had been warned by the prophets of God to depart from their evil deeds? But what means this? “Whosoever transgresseth and abideth not in the doctrine of Christ, HATH NOT GOD. He that abideth in the doctrine of Christ hath both the Father and the Son.” The Catholic Church having altered and changed and abolished many of the precious teachings of the Son of God, it is impossible that when she undertakes to act in the name of God she can do otherwise than take his name in vain. For, first of all, she has [Page 21] given us a man-made priesthood instead of the God-made priesthood of the Bible. Second, she has discarded the God of Israel, in whose image and likeness man is made, and of whom Jesus was the EXPRESS IMAGE (Heb. 1:3), and given us a god of their own make, who is without body, PARTS or PASSIONS, which, instead of being the greatest, wisest and most powerful of all, is a mere nothing at all. Indeed, the description given of him by the Catholic Church is the very best possible name for nothing at all. Third, she has abolished the gifts of the Holy Ghost promised to all nations wherever the gospel would be received and obeyed. She has neither apostles nor prophets, nor gifts of healing, nor prophesy, nor tongues, nor visions, nor revelations, nor power from God of any kind, any more than the Protestants, things that always followed the true priesthood or authority of God. Fourth, though the scriptures teach everywhere to the contrary, both by precept and ex­ample, the Church of Rome has set up the celibacy of both men and women above marriage, in point of being more honorable and virtuous, a thing that is not anywhere taught in scripture, but the contrary throughout. If it is more honorable to break the commandment re­quiring the marriage of the sexes than to keep it, why would not such a rule work equally well with the other commandments? Why not say it is honorable to keep the com­mandment, “Remember the Sabbath day to keep it holy,” etc., but more honorable and virtuous to break it? And again: It is an honorable thing to keep the commandment, “Thou shalt not bear false witness,” but more honorable to break or disregard it. Why should not these rules work? For marriage is just as binding as any other law or commandment. For the Lord Jesus and the law of God says: “It is not good that man should be alone.” (Gen. 2:18, 24; chap. 9:1; chap. 35:11) And Paul especially says, “To avoid fornication, let every man have his own wife and every woman have her own husband.” (1 Cor. 7:2) And again he says: “I will that the YOUNGER WOMEN marry, bear children, guide the house, and give none occasion to the adversary to speak reproachfully.” (l Tim. 5:14) And Heb. 13:4 says: “Marriage is honorable IN ALL, and the bed undefiled; but whoremongers and adulterers God will judge.” So what is there wrong about marriage that it should be sworn against by the authorities or clergy of the Catholic Church? Why we are told that it gives the priests more time to devote to the affairs of the church, and that as their faith requires the confession of sins on the part of the people, the priests are better enabled to keep those matters secret; whereas were they to be married, their wives would be likely to draw out those secrets and whisper them about. Indeed! It is a wonder that the Almighty has never thought of that! Are their labors on behalf of the people any more arduous than those of the clergy of other denominations? Or the ancient Hebrew priests, who had much more labor to perform than the priests of the Catholic Church? Besides, the Hebrew priests were also confessors of the sins of the people; but they never thought of swearing against marriage for any such excuses as the Catholic clergy offer. The whole tenor and teaching of the bible is that it is a great calamity for a man to die childless! In fact, that it is among the greatest of all calamities! I could give many ex­amples of this from Holy Writ had I the time. But here are a few items: Abraham had a large household, but not a son to his name; and he felt sad enough about it, and when the Almighty was making great promises to him he says: “Lord, what wilt thou give me, seeing I go childless and the steward (the chief) in mine house is this Eliezar of Damascus?” (Gen. 15:1-3) That was as much as to say, Lord, what is all this blessing and this great land to me, seeing I have no son of my own flesh to inherit it with me? And when the [Page 22] promise of a son was realized, there was great rejoicing and praise from Abraham and Sarah, the latter because her reproach among men had been taken away; for besides being a great calamity to be childless, it was also a great reproach to be barren. But, Isaac’s wife was barren also, and Isaac entreated the Lord for her, and here was gladness again at being blessed with offspring. And again, Rachel, one of Jacob’s wives, was barren, and in the anguish of despair she cried out, “Give me children or else I die.” And she also felt the blessing by saying: “God hath taken away my reproach,” when made a glad mother. The Prophet Samuel’s mother is another case from whom the customary reproach of barrenness was taken away at the birth of that mighty prophet, and praise and thanksgiving resulted. John the Baptist’s mother was another. “Thus hath the Lord dealt with me,” said she, “in the days wherein he looked on me to take away my reproach among men.” (Luke 1:25) Would to God that the same love for posterity, the same innocent, precious and holy sentiments might again return and take the place of the unnatural and diabolical sentiments of this present generation, where posterity is looked upon as a curse and is systematically dying out. Men live by God’s law, they die out by its violation. As often as men vow or swear that they will not marry, they not only swear that they will blot out their own names, but compel a corresponding number of women to blot out theirs also, and prevent them from fulfilling the end for which they were created. For the many tens of thousands of Catholic clergy that exist today, and that have existed for so many centuries, there must have all along been a corresponding number of females driven either to be harlots or well preserved old maids, two things which God has expressly forbidden; and from the commencement of this celibate life down to this day, the number must have been very great. So it is plain that this excessive piety upon the part of the Catholic clergy has done an incalculable and wholesale amount of evil, while it has done no good, but what could much better have been done by a married life. There is truly such a thing as being too pious to keep the commandments of God! Fifth, she has given us three kinds of baptism—sprinkling, pouring and immersion—whereas God has never authorized but one, that is immersion; but immersion is a mode she exceedingly seldom or never practices. Sprinkling is really the mode with her, and it being entirely removed from the true form of baptism, or immersion, they are justly accused here also of changing, altering and substituting their own inventions for the law of God. Indeed the Catholic Church accuses herself of having done this very thing, for her clergy confess that sprinkling was chosen by them as a substitute for baptism, and justify it on the ground that whatever is done by the authority of the Catholic Church is all justified in the sight of God. “The church cannot do wrong,” she says, because Jesus has promised “to be with her always, even unto the end.” It matters not what she does. The promise to them is unconditional. “Individuals may do wrong, but the church never,” is one of their principles. One cannot but feel astounded at the monstrosity of such doctrine. Why was it that God rebuked Israel so many times by the prophets and broke them down, and gave them so many times into the hands of their enemies and has made them wanderers among the nations, a hiss and by-word among them for many generations, if he can so easily sanctify the sins of the Catholic Church? [Page 23] Is not one people as dear to him as another? And if he can so easily ap­prove of the sins of the great Catholic Church, why could He not also as easily approve the sins of his own peculiar people, Israel? Has God finally come to have respect of per­sons? Has He altogether changed? Sixth, there is nothing in the eyes of God that is any more pure and innocent than a little child. “Of such,” says Jesus, “is the Kingdom of heaven.” Yet the Catholic Church pronounces them lost in hell unless they are (not baptized) but sprinkled to save them from the flames of hell. Thus God is made to do what the basest ruffian on earth would shrink from in horror! Thus might we go on examining the abuses, abolishments, changes and alterations which the Church of Rome has deliberately made in the doctrine of Jesus Christ till it would fill a good sized volume? On the principle that, “whosoever transgresses and abides not in the doctrine of Christ hath not God,” can we suppose that the Almighty or his son Jesus Christ has left the holy priesthood among that people for fifteen hundred years, to administer her heathen ordinances in his name? That he acknowledges their works to be his works? And those priests to be his ministers? Whosoever adds to or takes away from the things of God, his part will be taken “out of the Book of Life, and out of the holy city,” and from the covenants and promises made to those who serve him (Rev.22:18, 19). Verily no. None such are nor over were his ministers. Therefore in doing any of these things in the name of the holy three, they take God’s name in vain, and they will not be held guiltless. But, says one, what about the Protestant churches? Where do they stand? Alas for the Protestant churches! Church history shows only too plainly that all the older sects as the Lutherans, the Baptists, the church of England, the Presbyterians and others came out of the church of Rome in which their fore­fathers had lived for many centuries, as many sects before them had done also; and the younger sects, such as the Methodists, Campbelites, Quakers, Shakers and all the Reformed Baptists, Reformed Methodists, Reformed Presbyterians, and others have merely sprung from those older offshoots from the church of Rome. They are Rome’s granddaughters. One thing is clear and certain, and that is that there can be but one true Church. If the Church of Rome was the true church, as she herself claims, then the Protestant reformers as they are called separated themselves from and rebelled against the true church. And when they withdrew from it, they ceased to be ministers of that church; and whatever authority they had when in that church as its ministers, they forfeited when they left it. For when men separate themselves from the church of God, they can’t bring any authority out of it to build up a church in opposition to it. If so then the church of God would be two, clashing and making war upon itself, and Jesus says, “a house, or kingdom divided against itself cannot stand.” The Almighty therefore cannot be the author of a divided church, or a divided kingdom. As said before, if the church of Rome was the church of God when the reformers left it, then they left the church of God and all their church building ever since has been a vain thing, and utterly without authority from God, and at enmity against him. But on the other hand, if the Roman Catholic Church was NOT the church of God and was so vile, corrupt, heathen and apostate as the Protestant reformers say she was, and had been “for over seven hundred years,” then there was no true priesthood or authority to administer the ordinances of the gospel IN THAT CHURCH! And therefore the reformers COULD BRING NONE OUT WITH THEM. Consequently so far as this lack of authority is concerned, Protestants and Catholics of all ranks and conditions are alike destitute of it. This is precisely the view that every thinking man must take of this matter when the [Page 24] facts in the case are laid before him. There is no middle ground. That which is now called Catholicism was the national religion of the Roman Empire with the exception of the very few additions made to it in its more modern times. It was originated in the time of Constantine The Great, who in his day conceived the idea of harmonizing all of the religions that then existed which were very numerous, in his empire, both of Christians and heathens, into one national religion. The leaders of the numerous sects of both kinds at his request assembled together and the result of their deliberations was the Catholic faith as we now find it among the nations, with a very few exceptions as observed before, added in more recent times. This is a very sad picture given of the Christian religion in Constantine’s day—the time of the founding of what is now called the Roman Catholic faith. But John Wesley is very far from being alone in this matter. Goldsmith gives us in his History of Rome a very similar picture. Alexander Campbell also speaks of the apostasy of the early Christian church as follows: “Since the fullness of the great apostasy, foretold by the apostles and prophets, numerous attempts at reformation have been made. Societies, indeed, may be found among us, far in advance of others in their progress toward the ancient order of things,” (that is, the apostolic church, with its gifts and blessings) “but we know of none that have fully attained to that model. “The ancient order of things” which alone can “sustain” or support the true gospel of Jesus Christ are apostles, prophets, evangelists [high priests], pastors [elders] and teachers, called of God by revelation, with the gifts of the Holy Ghost promised to all true believers. Take away the officers of a nation and you take away the liberties, blessings and privileges of that nation, whatever they may have been. The United States, without its officers, would be a vast mob. There can be neither school district, town, county nor state, without their officers. Give them back their officers and the blessings of [Page 25] liberty, whatsoever they are, will return. When I say their officers I mean such officers as their constitution gives them. I don’t mean a set of usurpers who would ride into power in utter disregard of the constitution and the laws. You would not be very likely to have your constitutional liberties under a class of men of that stamp. You perceive then that the laws of any country, be they ever so good, give no guarantee of safety to life or property without their appropriate rulers. Just so, and upon the same principle, if we have not the same kind of rulers that the law and constitution and testimony of God calls for, we cannot expect to receive and enjoy the blessings of God’s kingdom. Give us the officers of the church and kingdom of God—apostles, prophets, evangelists [high priests], pastors [elders] and teachers, called of God by revelation, the chief of whom—is ordained under the hands of angels as in days of old, who will bring us the gifts and blessings promised by the Saviour of mankind; then we will enjoy the blessings, liberties, privileges, hopes, rejoicings and eternal life of the citizens of God’s kingdom, and not till then. It is a curious and interesting fact that many men may see the necessi­ty of God’s working as in days of old, and will contend and earnestly pray for him to do so, or “send by whom he would;” but when the Almighty in his own way, and his usual manner, condescends to answer the prayers and desires of these very men, they are very often found to be the first to reject it, and become its greatest enemies. Caiaphas, the high priest, prophesied that Jesus would die for that nation (the Jews) and also for the sins of the whole world, but we have no evidence that he ever followed him or regarded his teachings. (John 11:47-52; Matt. 26:57-68) Indeed he seems to have become a bitter enemy to Jesus. The mother of Jesus was poor, and his being born in a manger, and his traveling without purse or scrip to preach the gospel without a place to lay his head, were all too much and too low for the great Caiaphas to condescend or stoop to. And when God passed by the learned Alexander Campbell, and a host of other great ones, and condescended to take the young man Joseph Smith from his rural home in the backwoods, and by the ministry of angels made him the instrument in his hand to build up his church, with apostles and prophets, evangelists, etc., at its head according to the “ancient order of things,” with the pure gospel and the gifts of the Holy Ghost following—just what the Alexander Campbell desired, saw the need of, and prayed for; this was all too much for them! They had forgotten that “God hath chosen the poor of this world rich in faith,” and heirs of the kingdom of God; “that he chooses the “weak,” and the “simple” and the “despised” and the “base” things of the world to confound the wise, and to bring to naught things that are, that no flesh should glory in his presence,” (James 2:5; 1 Cor. 1:26 to 29) and of course it was too low for them to stoop to! O, yes. She is called “mystery” because there is no revelation from God, which gives light and understanding unto all men, in that church. Fog, mist and darkness surround all its members. They have nothing but the word and traditions of its priests to build their faith or their hopes upon! There is not one man in that church that KNOWS his faith is true. In the church of God men are not thus left in ignorance; they know that they are not deceived. “Confusion the great,” because the more one undertakes to prove his faith and her traditions to be true by the word of God, the more he is confused and bewildered. “The Mother of Harlots, and Abominations of the Earth,” because she has brought forth, by her corrupt and abominable faith and teachings, many churches, a good deal like herself, worshipping the same nonsensical nonentity of a god, denying the necessity of revelation, denying the gifts of the gospel promised by the Saviour of mankind to all believers; practicing the same sprinkling for baptism, making the same false claim to the authority of the holy priesthood, and holding on to their errors with the same cast iron unwilling­ness to yield themselves to the truth. Indeed in one way and another, directly and indirectly, the Church of Rome is held accountable before God for all the abominations committed for many centuries upon the earth, or, at any rate throughout Christendom. In all ages of the world, the church of God, organized and led by him, was spoken of as “the Bride, the Lamb’s wife.” But whenever this church forsook the ordinances of God, and went over to the embraces of idols, kings and princes, following their heathen rules, laws and counsels, instead of the laws, counsels and commandments of God, she was then called and esteemed a whore; and the generations arising from her were called harlots and bastards, (see Rev. 17:1-18; Jer. 31:31, 32; Jer. 3:20; Ezek. 16:28-35; 2 Cor. 11:2; Hosea 2:2-4). Hence the justice and propriety of naming this great apostate church, “The Great Whore,” “the whore of all the earth,” a wife put away from her husband, because of her adulterous practices. The reader is advised to examine the above passages and their connections for himself. Having shown the utter groundlessness of the claims of both Catholic and Protestant churches to hold any genuine priesthood or authority from God, to administer the ordinances of the gospel in his name, some will by this time, perhaps, be enquiring, whence the claim to the priesthood by the Latter Day Saints? If neither Catholic nor Protestant churches possess any authority from God to administer the ordinances of his house or his gospel, from what source have the Latter Day Saints that power and authority? The answer to this question is that they have not received it from either a Catholic or Protestant source. If we were ever so willing to make a claim of that kind we know that we could not reasonably do it; for we have shown a hundred times by many abler pens than mine that no such authority is to be found among them. 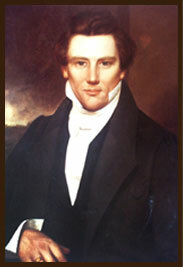 The claim made by the leader and founder of the church of the Latter Saints and his witnesses is that, in answer to the prayer of faith, in the name of Jesus Christ, God sent the angels of his presence to confer the Holy priesthood upon Joseph Smith and Oliver Cowdery, his earliest associate in the bringing in of the Latter day dispensation; and they (the angels) (did it according to the order of God, by their voice and the laying on of their hands. There is no other way of conferring priesthood or the authority of God to act in his name, only under the hands and voice of those who lawfully possess it. These heavenly personages claimed to be the ancient apostles or ambassadors, Peter, James and John, who each in [Page 27] his time possessed this highest order of the priesthood after the order of Melchisedec; which order was after the order of the Son of God. But Joseph Smith alone held this highest and most holy order of that priesthood, and Oliver Cowdery was ordained to a lesser or subordinate order or office in said priesthood; and as the church began to be organized by these men, according to the instruction of the God of heaven, there were many others ordained under their hands to the lesser offices in this church. Finally there were Twelve Apostles called and ordained and a quorum of seventy elders also to assist and accompany those Twelve in the preaching of the gospel to the nations. Herein is the claim of the church of Jesus Christ of Latter Day Saints to the authority to act in the name of God, as his ministers in the ordinances and sacraments of his house, church, or kingdom. And if these things sound strange, as of course they do, equally strange have the claims of all other prophets sounded in their day and generation. They all have had just such a story to tell to their fellow men; for they were all called, ordained and sent alike, by the same God, and because of the same strong and mighty faith. And Jesus himself was no exception to the rule. And that Jesus was ordained, and that under the hands of his heavenly father himself, I will now proceed to show. All the prophets and apostles who have seen him, have testified to his being in form like unto man; and they have never testified to his having any other than the human form. Jesus we are told was the EXPRESS IMAGE of his (God’s) person. Stephen at being stoned to death, as a martyr, had the heavens opened to him and he saw “Jesus standing at the RIGHT HAND of God.” (Acts 7:54 to 58) And the testimony of all the apostles who have spoken of Jesus’ ascent into heaven is that he sits with God on his throne, at his RIGHT HAND. “When he had purged our sins, sat down at the right hand of the majesty on high.” (Heb. 1:3) “But this man after he had offered one sacrifice for sins forever, sat down on the right hand of God.” (Heb. 10:12) “Who is gone into heaven, and is on the right hand of God.” (1 Pet. 3:22; Eph. 1:20; Col. 3:1) Yes, God has a right hand and a left hand, and is exactly in the image and likeness of his son Jesus Christ, “who was made in all things like unto his brethren,” his fellow men. (Heb. 2:17) And hence there is nothing mysterious nor unreasonable in his being anointed, consecrated and ordained, literally under the hands and voice of his Heavenly Father, any more than in Moses being made “a ruler and a deliverer to Israel by the hand of the angel that appeared to him in the bush.” (Acts 7:35 ) Or any more than in David being made a mighty prince, and deliverer to Israel under the hands and voice of the mighty prophet Samuel. Or any more than in Joshua being made a mighty leader under the hands of Moses. Again Peter says to Cornelius and his family and friends: “That word I say ye know, which was published throughout all Judea, and began from or at Galilee, after the baptism which John preached; how God anointed Jesus of Nazareth with the Holy Ghost, who went about doing good, and healing all that were oppressed of the devil …And he commanded us to preach unto the [Page 29] people, and to testify that it is he which was ordained of God to be the judge of quick (the living) and the dead. Now the greatest, grandest and most glorious point in the claims of Jesus of Nazareth is, and was, that he was called by the voice of God, and anointed under his hand. By careful reading we find that the fact of his being so called, and anointed, formed the most powerful and important principle in the ministry of the apostles and elders, who proclaimed the gospel of Jesus to the nations. Indeed it is safe to say that if Jesus had not been so called and anointed, he never would have obtained a resurrection from the dead, either for himself or for any other man. It was by his spotless righteousness and faith that he obtained the anointing, and by the anointing he attained to the resurrection, and by attaining to the resurrection, he is put in possession of the knowledge and power to raise up all others from the dead, who are worthy. And the same was true of the apostles and those ordained by them, for he has said to them: “As my Father hath sent me, even so send I you. That is: As my Father has called and anointed me to preach glad tidings unto men; even so are ye called of God and anointed and ordained under my hands for that same purpose. This will appear the more clear from the following: “And he ordained Twelve that they might be with him (as assistants in his ministry) and that might send them forth to preach and to heal sicknesses, and cast out devils.” (Mark 3:14 , 15) Why could he not have sent them to do these things without ordaining them? Simply because it would neither be lawful to do so, nor could they receive either authority, power or the inspiration necessary to guide them in their ministry, or priesthood to which they were called. That is the whole secret of ordination; and it was just as true of Jesus as any other man. Why could he not be a witness of Christ’s resurrection without being ordained to it? It was because the office work of one of the Twelve demanded greater gifts, greater inspiration and greater authority than a less responsible office. Now in these things I have shown how men are called, and authorized to act in the name of God and of the Lord Jesus, and the Holy Ghost as his ministers in the ordinances of the gospel. The same is true of Old Testament ministers of God. All these things show that when men receive office under the hands of those truly called, ordained and sent of God to accomplish his work, and minister in his name, receive a power and intelligence that leaves them no longer in doubt but justly qualifies them for the work not only in one age but in all ages. “The Kingdom of God,” and the church of God are one and the same. Wherever the church or kingdom of God is, there the priesthood or the authority of God is to administer the ordinances of that church or kingdom. In fact there can be no [Page 31] church or kingdom of God without the priesthood of God, for the church of God never was, and never will be organized or built up without it. A single member of it cannot exist without it and hence it is of the highest importance to seek first of all for the church or kingdom of God. Simply because no man can be a member of that church without baptism for the remission of sins, and the laying on of hands for the gift of the Holy Ghost, and it takes men holding a lawful priesthood to baptize and to lay on hands for that purpose. And now you think all this strange simply because of the heathen traditions handed down from heathen priests, who have taught us and our fathers to expect prophets and gifts and blessings promised no more. [This is] proof positive that they do not understand the scriptures. These prophets will have power to do mighty miracles, signs and wonders, such as Moses and Elijah did in their day. Turn waters to blood, shut heaven that it rain not, and smite the earth with plagues as often as they will, because of the wickedness of its inhabitants. And the enlightened Christian nations, who are educated to believe that “the age of prophets and miracles has passed away,” and that they “need no more,” will have great rejoicing at the slaying of these two mighty prophets. Read the text carefully. We are assured by the word of God that these things are nigh at hand, to be fulfilled. Ezek. 20:33 to 38, gives us to understand that God by an oath has decreed to redeem Israel in the last days by a mighty hand such as he brought Israel out of Egypt by, and reader, that means by a mighty prophet such as Moses was—nothing more and nothing less. Isaiah tells us also that God will purify Israel and restore their judges as at the first, and their officers, as at the beginning; that is as in the days of Moses; “afterward thou (Israel) shalt be called the city of righteousness—the faithful city.” (Is. 1:25, 26) The whole line of prophecy from Genesis to Revelations all agree in this; that God in the latter days is to commence a mighty work among the Gentiles that will ultimately gather Israel from all the nations of [Page 32] the earth; that he will reveal the holy priesthood, as in the days of Moses; that he will set up his kingdom by calling and anointing men to act in his name, as in days of old, and as in apostolic times; that what­ever nation or people or kingdom will not come into it will be destroyed by his judgments. In fact that work is just such a work as Joseph Smith commenced and brought forth by revelation and the ministry of angels. And though all Latter Day Saints are not in all things as perfect as they should be and are men and women of like passions, as other men and women, still God has aspired us that he will chastise them until they overcome and are clean before him. And now, reader, whoever you may be, we, the elders of the Church of Jesus Christ of Latter Day Saints, are well assured by many infallible proofs that God raised up Joseph Smith and made him by the hands of angels a mighty prophet, and that the Book of Mormon is the standard above referred to, in the Book of Isaiah and other scriptures, for it contains the pure gospel of Jesus Christ, and errs not therein; and that through the instrumentality of Joseph Smith, and others whom God called and were ordained under the Prophet Joseph’s hands, God has set up anew that kingdom which, Jesus commanded all men first to seek, as the most necessary thing of all, for there is the authorized priesthood and we are assured by revelation and by many great truths that an authorized priesthood is found nowhere else on the earth. Whoever seeks the truth will find it there to his entire satisfaction. If you lived in the days of Jesus Christ, and paid no attention to anything he taught, and hearkened only to the stories of his enemies, you would never have been a believer in him. And it is just so with the enemies of Joseph Smith. Hearken to them and you will never believe that God raised him up as a prophet. WINGFIELD WATSON, An Elder in the Church of Jesus Christ of Latter Day Saints. Spring Prairie, Wis., Dec. 26, 1899 .